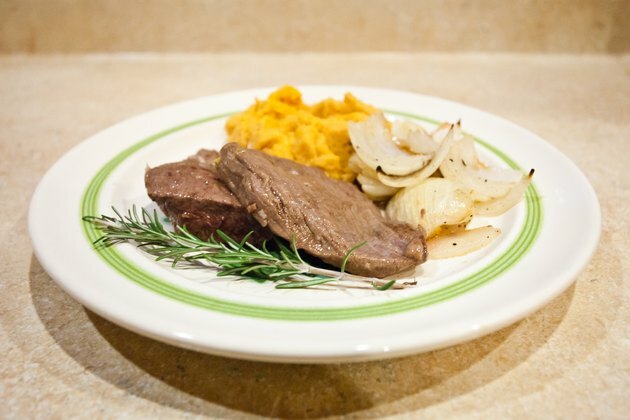 Shoulder steak is a boneless cut of beef that's often alternatively labeled as London broil, English steak, Swiss steak or beef chuck shoulder steak. It is rich in flavor, typically inexpensive and low in fat; however, "New York Times" food writer and cookbook author Mark Bittman cautions that, because of its large amount of muscle and connective tissue, shoulder steak can end up tough and unpleasantly chewy if not cooked correctly. Bittman contends that the best way to cook shoulder steak is by braising. 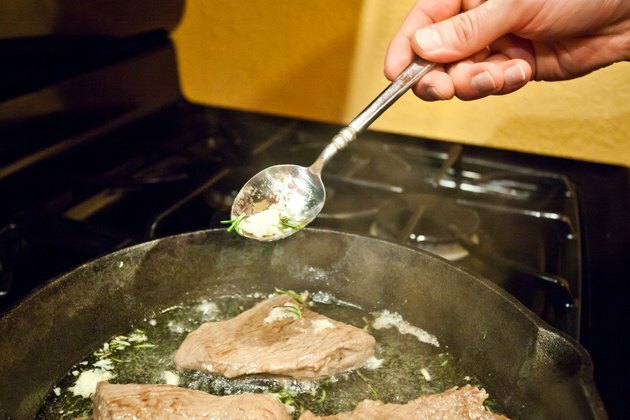 Braising a cut of beef involves browning the meat in a small amount of fat, adding a liquid like water or broth, then covering the pan and allowing the cooking process to finish over low heat. This method adds little saturated fat if you use a vegetable oil like olive oil for the browning step and allows plenty of room for variety: Vary the herbs and seasonings used, or braise the steak in wine or juice. Add chopped carrots, potatoes or zucchini for more nutrition. You can grill shoulder steak successfully, but only if you marinate it first, says the Texas Beef Council. For a marinade that can help add tenderness to your shoulder steak, use one that includes oil, seasonings and an acidic component such as vinegar or lemon juice. Including salt can enhance the marinade's flavor, but avoid it if you're watching your sodium intake. 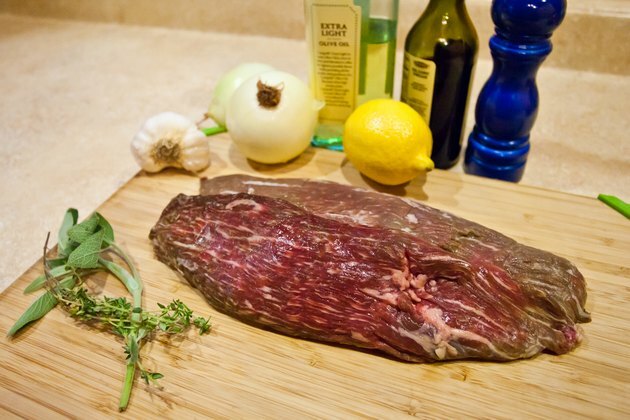 To help the marinade penetrate as far as possible into the steak, use a sharp knife to make diagonal gashes into the meat's surface and allow it to marinate for between six to 24 hours. Broiling is another low-fat method that can be used to cook shoulder steaks that have been marinated for at least six hours and up to 24 hours. The key to broiling shoulder steak is to take the thickness of the cut into account. If you have a steak that is approximately 1 inch thick, adjust your rack so that the surface of the premarinated meat is between 3 to 4 inches from the heating element. For thinner cuts, aim for the meat to be about 2 to 3 inches from the heat. Stewing differs from braising in that stewing involves slowly cooking chopped pieces of meat in liquid instead of a large, whole cut of beef. 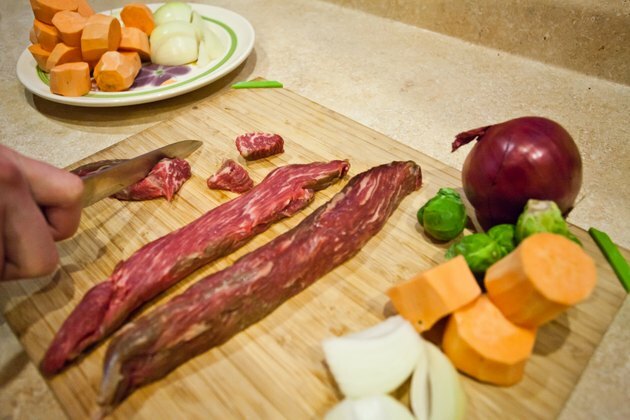 Cube the shoulder steak, brown it in oil and cook it at a simmer in your choice of liquid and seasonings. Make it into a typical stew by adding chopped vegetables and thickening it with mixture of cornstarch or flour and water. A slow cooker is a simple way to prepare stewed shoulder steak: After browning the meat, place it in the slow cooker with the liquid and cook on low for at least seven hours, adding the thickener in the final half-hour.